A Hindu man tells Gandhi that he smashed a Muslim child’s head against a wall and killed him–how can he be redeemed? How can he be saved from the fires of hell? Gandhi tells him there is a way out of hell, if he finds a Muslim boy who has been orphaned by the violence and adopts the boy, raising him as a Muslim. The Hindu man can redeem his hateful act with an act of love which is equally great. God is fearlessness. God is the source of Light and Life and yet He is above and beyond all these. God is conscience. He is even the atheism of the atheist. For in His boundless love God permits the atheist to live. I believe that we can all become messengers of God, if we cease to fear man and seek only God’s Truth. I do believe I am seeking only God’s Truth and have lost all fear of man. Let us first consider what state of things is described by the word “civilization”. Its true test lies in the fact that people living in it make bodily welfare the object of life…It has been stated that, as men progress, they shall be able to travel in airship and reach any part of the world in a few hours. Men will not need the use of their hands and feet. They will press a button, and they will have their clothing by their side. They will press another button, and they will have their newspaper. A third, and a motor-car will be in waiting for them. They will have a variety of delicately dished up food. Everything will be done by machinery. Formerly, when people wanted to fight with one another, they measured between them their bodily strength; now it is possible to take away thousands of lives by one man working behind a gun from a hill. This is civilization. Formerly, men worked in the open air only as much as they liked. Now thousands of workmen meet together and for the sake of maintenance work in factories or mines. Their condition is worse than that of beasts. They are obliged to work, at the risk of their lives, at most dangerous occupations, for the sake of millionaires. It is a wrong to destroy caste because of the outcaste, as it would be to destroy a body because of an ugly growth in it or of a crop because of the weeds. The outcasteness, in the sense we understand it, has therefore to be destroyed altogether. It is an excess to be removed, if the whole system is not to perish. Untouchability is the product, therefore, not of the caste system, but of the distinction of high and low that has crept into Hinduism and is corroding it. The attack on untouchability is thus an attack upon this ‘high-and-low’-ness. The moment untouchability goes, the caste system itself will be purified, that is to say, according to my dream, it will resolve itself into the true Varnadharma, the four division of society, each complementary of the other and none inferior or superior to any other, each as necessary for the whole body of Hinduism as any other. Class is the new way to discriminate against people, to hold people down, to hold people in their place based on where their kids go to school, how much money they make, what they drive, where they live and what type of clothes they have and how much they have in their account for retirement…It’s not about racism anymore, it’s classism. Like Paula Deen, she was old school with it. They like, ‘we don’t do it like that anymore, that’s racist. We classist now.’ Classism is when they try to say, ‘You’re a rapper…your girl is on a reality show so you’re not up here with us. We’re old money.’ It’s snobbery and I’m not into all that snobbery, seriously. All we want to do is to make awesome stuff. All we want is a real shot. The English have not taken India; we have given it to them. They are not in India because of their strength, but because we keep them…Who assisted the Company’s officers? Who was tempted at the sight of their silver? Who bought their goods? History testifies that we did all this… Is it not then useless to blame the English for what we did at that time?…The causes that gave them India enable them to retain it. Some Englishmen state that they took and they hold India by the sword. Both these statements are wrong. The sword is entirely useless for holding India. We alone keep them. I have in my life never been guilty of saying things I did not mean-my nature is to go straight to the heart and, if often I fail in doing so for the time being, I know that Truth will ultimately make itself heard and felt, as it has often done in my experience…I may be a despicable person, but when Truth speaks through me, I am invincible…I am devoted to none but Truth and I owe no discipline to anybody but Truth…I have no strength except what comes from insistence on truth. I am a humble but very earnest seeker after Truth…I am a learner myself, I have no axe to grind, and wherever I see a truth, I take it up and try to act up to it. Even our greatest and most humble people, Mahatma Gandhi, Martin Luther King, had to have had narcissistic components to their personality. They gravitated toward attention, they gravitated toward crowds. If we believe that they didn’t get a charge out of standing before a crowd of half a million people, or in the case of Gandhi millions, and moving an entire nation with their words, well we don’t really understand human nature then if that’s what we think of. What’s the point of all of this? 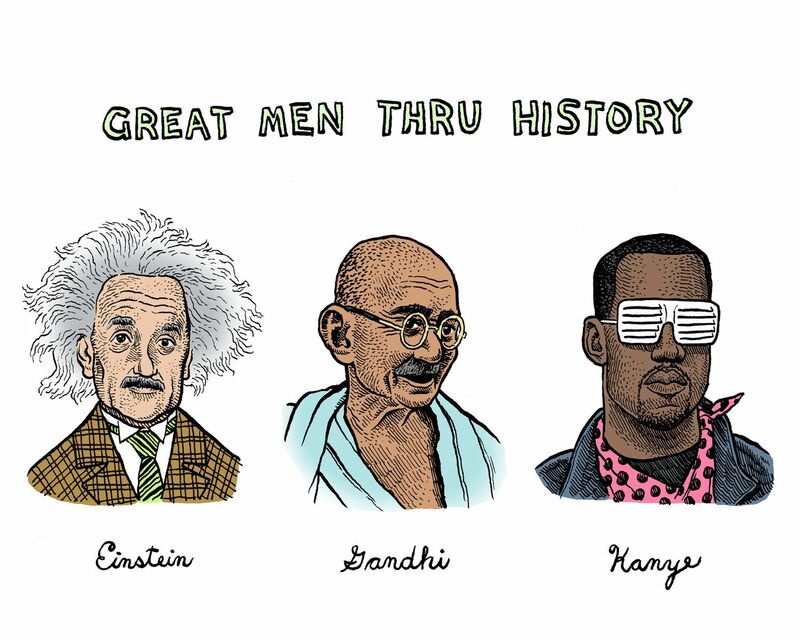 Aside from helping my first year students think about Gandhi in a more human way, I want to make the point that the people who are selling the “Kanye betrayed us all” and “Kanye has lost his mind” stories are probably the same people who, a century ago, would have called Gandhi a “half-naked seditious fakir”. There is no intellectual curiosity in them, no interest in thinking about anything. They read texts with no charity, nuance, context, or kindness. The condition of England at present is pitiable. I pray to God that India may never be in that plight. That which you consider to be the Mother of Parliaments is like a sterile woman and a prostitute. Doctors have almost unhinged us. Sometimes I think that quacks are better than highly qualified doctors. Let us consider: the business of a doctor is to take care of the body, or, properly speaking, not even that. Their business is really to rid the body of diseases that may afflict it. How do these diseases arise? Surely by our negligence or indulgence. I overeat, I have indigestion, I go to a doctor, he gives me medicine, I am cured. I overeat again, I take his pills again. Had I not taken the pills in the first instance, I would have suffered the punishment deserved by me and I would not have overeaten again. Railways, lawyers and doctors have impoverished the country so much so that, if we do not wake up in time, we shall be ruined… Railways accentuate the evil nature of man. I love railways! But we take Gandhi seriously, despite the fact that he says lots of wrong things. When we read him, we read him charitably, and we try to understand what might have motivated him to take the positions he takes. At least, this is what we do if we want to get good marks on our exams. Let’s try to do that for everybody. Even Kanye. Good travels at a snail’s pace—it can, therefore, have little to do with the railways. Those who want to do good are not selfish, they are not in a hurry, they know that to impregnate people with good requires a long time. But evil has wings. To build a house takes time. Its destruction takes none. So the railways can become a distributing agency for the evil one only. It may be a debatable matter whether railways spread famines, but it is beyond dispute that they propagate evil.